In the past two blogs, I talked about how you can prevent the aging process by boosting collagen production in your body. In the next two newsletters, I would like to talk about how you can prevent the aging process by doing some simple and important things to protect the existing collagen in your skin. 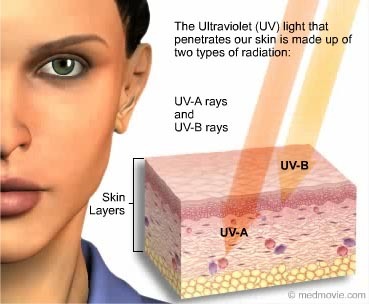 90% of the collagen damage that occurs from environmental factors is due to exposure to Ultraviolet A/B rays; therefore, it is important to protect the existing collagen with a broad spectrum SPF 30 sunscreen which protects you from both Ultraviolet A & Ultraviolet B rays which cause sun spots, wrinkles, sagging skin and skin cancer. You should use sunscreen everyday–even if it is raining, cloudy, or snowing. Make sure to reapply the sunscreen every 3-4 hours if it is sunny and you are out all day, sweating, or swimming. Tanning beds or booths are not safe as they also expose you to high levels of Ultraviolet A and B rays. It is better to get an organic spray tan that lasts up to a week and is very safe! Avoid exposure to toxins such as the 4,000+ toxins found in cigarettes which cause damage to the existing collagen in your skin. Smoking decreases blood flow to the biggest organ in the body, your skin. And decreased blood flow means decreased oxygen and nutrients (such as Vitamin A delivered to your skin) which accelerates the aging process.. In addition to the toxins and decreased oxygen delivery, the expressions you make while smoking such as pursing your mouth and squinting your eyes, also lead to smoker’s lines around the mouth and eyes (crow’s feet). Ten years of smoking is enough to significantly accelerate the aging process.